Bridgestone Blizzak WS60 snow tires have been called the ultimate in snow tires for good reason; they get you where you want to go regardless of snow, slush or ice. That is saying a lot, but these Bridgestone Blizzak tires can back it up. You’ll find yourself having much better confidence having to deal with driving in bad weather. The tire itself features a unique Tube Multicell tread compound. Without getting overly technical, the compound looks sort of like swiss cheese with all of the tubes and cells it contains. How this helps with traction is quite simple. The Tube Milticell tread gets rid of the water between the contact patch of the tire and the road’s surface that is snow or ice covered. This enhances the grip of the tire and gives it more “stickiness” so to speak. Blizzak WS 60 tires come in a directional tread design and feature independent tread blocks to go along with 3-D zigzagging sipes that push away the slush and water from under the tire for much better handling and braking. UNI-T technology and twin steel belts that are spirally wound with nylon combine to give the tire more strength and stability at higher speeds. It also gives your vehicle a much more comfortable ride. Bridgestone has even made it easier to know your useable tread depth by having an indicator in the tread that when worn down enough, lets you know the tire is 50% worn and you have only 10% of the Tube Multicell compound left. 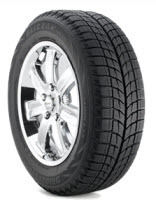 Prices on the Blizzak WS60 winter tire range from around $85 for the 14 inch series to approximately $200 for the much larger 18 inch series tires. Get the Bridgestone tires coupons below (if exist), or find all other tire reviews and discounts for tires. Who Are Bridgestone Blizzak WS60 Tires Designed For? Bridgestone tires has developed the Blizzak WS60 for all types of vehicles who need a solid performing snow tire that performs well not only on snow, but equally as well on ice and slush covered roads. Bridgestone does not provide a tread life guarantee on the Blizzak WS60, however you will find a first 1/32 inch of wear guarantee on the tire’s uniformity. Materials and workmanship are covered for 5-years. Bridgestone will prorate the amount down until the last 2/32 inch of useable tread depth on the tire. Final Note: Bridgestone recommends buying Blizzak WS60 winter tires in sets of 4 only to ensure better overall handling and performance.